In this quick WallaceChev Car Tips walkthrough we’ll tell you what your Vehicle Identification Number (VIN) is and why you might need it (1), what it looks like (2), and most importantly, where you can find it (3). 1) What Is A VIN Number and Why Might I Need It? Your VIN number is a special, 17-character identification that is unique to your vehicle and it contains vehicle-specific information like: trim, engine, exterior colour, vehicle model, options, engine size…it’s a quick overview of what is contained on the vehicle. You might need your VIN: when you call in to make to make an appointment at the dealership; for insurance purposes; if you need roadside assistance; and other similar vehicle-specific scenarios. 2) What Does My VIN Look Like? 3) Where Can I Find My VIN? Luckily, the VIN is easy to locate and can easily be found in one of two places. Driver’s Door: Open up the front, driver-side door and examine the inside of the door frame on the vehicle. You should see the VIN either on the vehicle frame itself (near the bottom) or on the middle edge of the door. 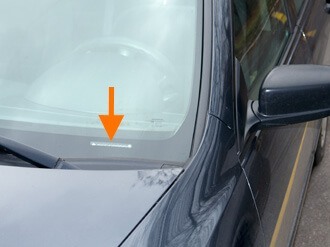 Bottom of the Windshield: Stand in front of your vehicle and look at the bottom right hand corner of the windshield. You should see it right at the bottom corner of the glass. Have a look at our picture below. Still can’t find your VIN number? No worries, simply give us a call at 905-878-2354 and we’ll be more than happy to let you know where to find it.